Elderstatesman and National Chairman of the Social Democratic Party (SDP), Chief Olu Falae has decried the do-or-die attitude of politicians towards the February 16, general elections. Like other prominent Nigerians, he said, he was frightened by the ominous signals of violence and killings across the country. Falae disclosed this in an exclusive interview with Senior Editors of The Hope at his residence in Akure, the Ondo state capital. “Let me tell you, I’m more scared than you. I’m more frightened than many of you, because I am closer to power. I was in power before and today I’m closer to those in power and their attitude frightens me. To them, it is as if it is a matter of life and death”, he stressed. 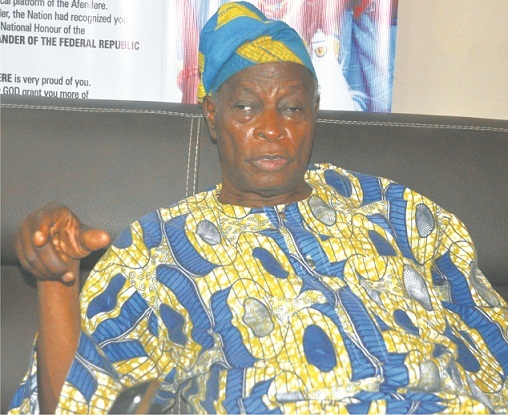 The former Secretary to the Government of the federation and an Afenifere leader also cleared the air on the purported crisis within Afenifere, noting that there was no leadership crisis within the group, just as he affirmed that Chief Reuben Fasoranti remains the recognised National Leader of the group. He equally confirmed that Afenifere was not unanimous as to the choice of presidential candidate for the forthcoming elections even though large chunk of the group supported the PDP presidential candidate, Atiku Abubakar. He hinged the reason Afenifere is supporting Atiku on the fact that he is more likely to restructure Nigeria, especially if the contest was between Atiku and President Muhammadu Buhari. “We are not unanimous as to the choice of presidential candidate. But there are strong elements in Afenifere who believe that Atiku is more likely to restructure Nigeria than Buhari. I agree with them. That is why large chunk of Afenifere is supporting Atiku and advocating that all of us should support him. “Yes, Atiku is more likely to restructure but that is if the choice is between Atiku and Buhari, but since my own candidate, Donal Duke is now running, I will choose him. He is the best candidate in terms of whatever criteria you set to evaluate any candidate, whether education or experience. “He was governor of Akwa-Ibom for eight years and he left his mark in his own generation. He is the kind of person Nigeria needs now. He is a youth and 70 percent of the voters in Nigeria are youths. “He is not out of touch with the problems of Nigeria, especially unemployment and insecurity. All in all, my own candidate, Donald Duke is the best candidate. “I believe that our party is most likely to restructure if we win. But as you are aware, our party has problem with nomination in the recent times and we were not sure of what was going to happen. But the Court of Appeal has ruled that former governor; Donald Duke was duly nominated by the party.